Rebecca was born near Wolverhampton into a creative family. Her mother was an artist and teacher, her father an architect, her brother a painter. After a Foundation Course at Wolverhampton University in Art and Design she gained a BA Hons at Wimbledon School of Art in theatre design. She has been lucky enough to work with some highly creative people, on some fascinating projects. These include sculpting the famous ceiling in Harrods Food Hall and producing work for Warwick Castle museum and Madame Tussauds. Rebecca was design assistant to Kevin McCloud, and worked with top theatre designers including Terry Parsons and Maria Bjornson. She has worked on West End shows including Aspects of Love and Phantom of the Opera, specialising in paint finishes. Rebecca has done Post-production work for the BBC and has illustrated 10 travel guides for Bradt Publications. Rebecca has painted dancers at English National Ballet and Laine Theatre Arts. Theatre commissions and paintings of actors in West End shows include Gavin Lee as Bert in Mary Poppins at the Prince Edward Theatre, and the cast of Peter Pan at the Savoy Theatre. 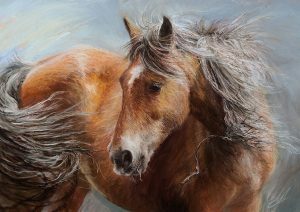 Now living in Devon, Rebecca’s subjects include horses and landscapes. 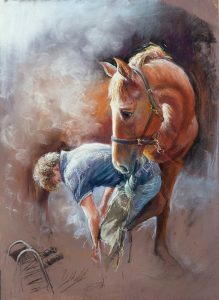 She has become well known for her Equestrian Art, and was invited in 2018 to be an Associate of the Society of Equestrian Artists. 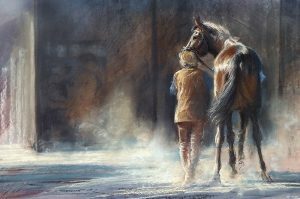 She has exhibited with the Pastel Society and in 2017 and 2018 was shortlisted for the Artists and Illustrators ‘Artists of the Year’, exhibiting at the Mall galleries in London. She undertakes commissions from around the UK and overseas. 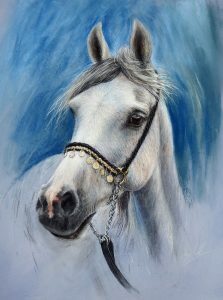 Rebecca teaches and demonstrates pastel painting, writes for Leisure Painter Magazine, Paint & Draw Magazine and the SAA, and teaches online with Art Tutor.com. 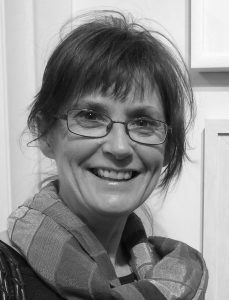 In 2013 she founded The New Pastel School with her good friend and pastel artist Nel Whatmore, teaching courses in the UK and Italy. She is currently writing a book, ‘Pastels for the Absolute Beginner’ for Search Press, to be published in 2019. Training in Theatre Design started my lifelong love of atmosphere, movement and drama. Pastels are the perfect medium, allowing me to simultaneously combine drawing and painting; making marks with energy, fluidity and precision. In all of my work, I am interested in conveying what it feels like to be there, not just what it looks like. 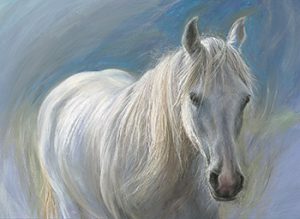 I love to paint horses, and the people who work with them, as well as Dartmoor, animals, people and street scenes.